Surgeons perform a cesarean section. A new report raises concerns about rising rates of this procedure around the world, from Brazil to China. C-sections now outnumber vaginal deliveries in parts of southeast Europe, Latin America and China. Even in poor countries, the rates can be extremely high at clinics. For example, in Bangladesh, less than 60 percent of births occur at a clinic, but when they do, about 65 percent of them are C-sections. The rates can be even higher in private clinics. For example, in Brazil, 80-90 percent of births in private clinics are now C-sections, compared with about 30-40 percent of births in public hospitals. Such high rates are due mainly to an increase of elective C-sections, says Salimah Walani, the vice president of global programs at March of Dimes, a U.S. maternal and child health organization. "The procedure is done when it is not really necessary or indicated," she says. Then the surgical procedure can do more harm than good for moms and babies, Walani says. For a mom, an elected C-section can raise the chance of death by at least 60 percent, and in some circumstances as much as 700 percent, several studies have reported. And it increases a woman's risk of life-threatening complications during childbirth, such as bleeding, uterine rupture, hysterectomy and cardiac arrest by about fivefold. This risk rises even further in subsequent deliveries. For babies, C-sections raise the chance of obesity and autoimmune diseases later in life. When the procedure occurs before 39 weeks, an early birth increases the infant's risk of respiratory problems. So what's driving the global rise of C-sections? It's likely three factors working together: financial, legal and technical, says Holly Kennedy, a professor of midwifery at the Yale School of Nursing and contributed to one of the studies. "As an obstetrician told me ... 'You're going to pay me more [to do a C-section], you're not going to sue me and I'll be done in a hour,' " Kennedy says. 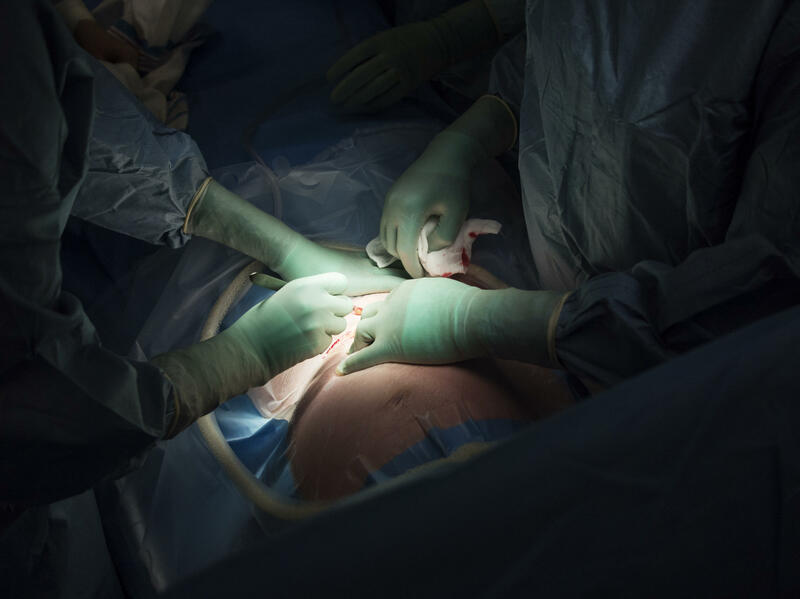 When it comes to C-sections, there seems to be an optimal rate that provides the most benefit to women and babies. Doctors are still debating what that optimal rate is — and it probably depends on the location. The World Health Organization suggests it lies between 10 and 15 percent, while a more recent study found it is a little higher, around 19 percent. North America and Western Europe are well above this optimal rate, with 32 percent and 27 percent of babies in 2015 delivered by C-section, respectively. The only region with a higher rate than North America is Latin America and the Caribbean, where 44 percent of all deliveries were C-sections in 2015. To bring these rates down, hospitals need to pay doctors equally for vaginal births, a team of researchers write in a commentary. At the other end of the spectrum, sub-Saharan Africa is still struggling to give moms access to C-sections when required. Across this region, the C-section rate has changed very little since 2000, hovering right around 5 percent. So many moms around the world end up with less-than-optimal care when it comes to C-sections: It's either too little too late, or too much too soon.